The Settings menu provides access to your account information, and allows you to change your PropertyRadar preferences. 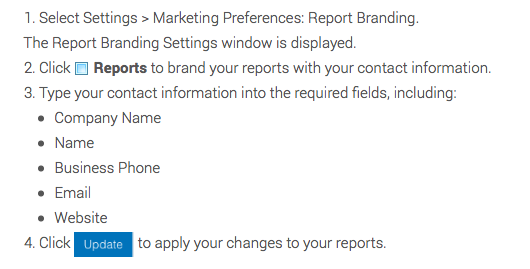 Your preferences can be very powerful tools for messaging, searching, and marketing. You can change your subscription (package/term), change your payment method, or cancel your subscription using the Billing window accessed from the Settings menu. To open the Billing window click Billing. To cancel your PropertyRadar account, click Cancel. the ability to share saved searches, and saved properties (including: Interest Level, Status, Tags, Photos, Notes, Files, Investment Analysis, and Title Research and documents). the ability to create workflows to manage the investment process by using property information (status, lists, etc.) to coordinate work between team members. 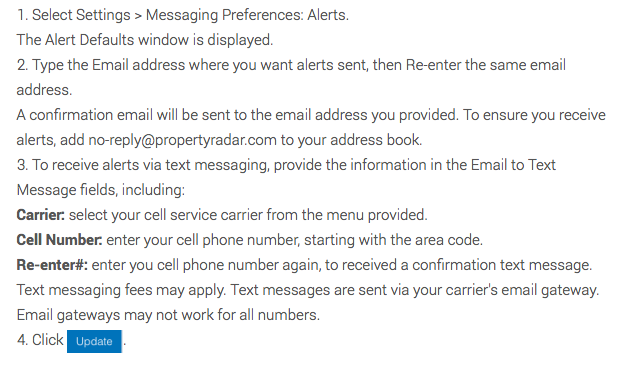 You can set up the Email and Alert messages that are sent to your selected contact(s) through PropertyRadar, using the Settings > Messaging Preferences. When you email property information to clients and coworkers using PropertyRadar you use the Email Report window. 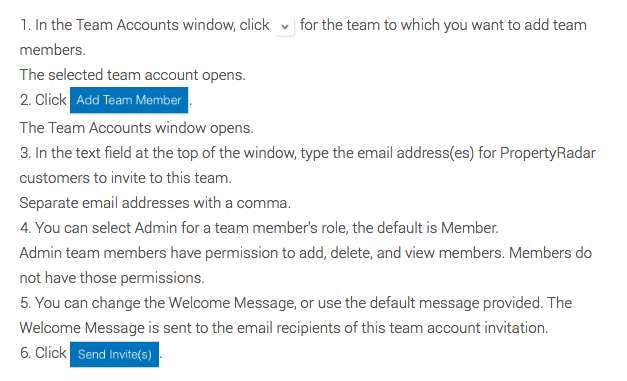 When you set alerts to remind you of new matches or status changes to your Saved Searches or Lists, you'll need to provide the email address or smart phone number (for text messages) where the alerts are to be sent. By entering your search preferences, PropertyRadar provides information how you want it. Using the Setting > Search Preferences, you can select your default location, list view columns, and property profile layout. By selecting a default location, your searches will automatically default the map and the Trustee Sale Schedule to the state and county you choose. PropertyRadar provides you with marketing tools to help you in your business dealings. 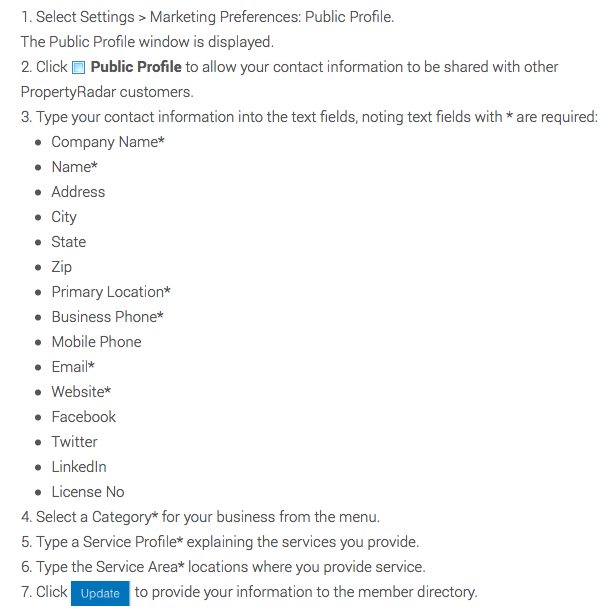 By setting up these marketing tools with your information, you can brand reports, create a public profile, and add the PropertyRadar website widget to your website. You can set your Status, and Investment Analysis preferences, to speed-up your workflow in PropertyRadar. You can change the default Investment Analysis settings used in the Property Profiles. Do not clear your local settings unless a PropertyRadar support team member directs you to do so. This caution is in place to make sure your data is not lost inadvertently. PropertyRadar Support is available to help ensure your successful use of our tool and data.